Abbreviation of Albanian State Bank BSHSH, in a semicircle, near five-pointed star (repeated). Albanian peasant woman, with sheaf of wheat, and a mechanic. On some sites it is indicated that the man is a mechanic (apparently, based on a wrench sticking out of his pocket). A man points to a woman with his hand, the way ahead (maybe, symbolically, "the path to a brighter future", or, maybe, the beauty of the surrounding area). 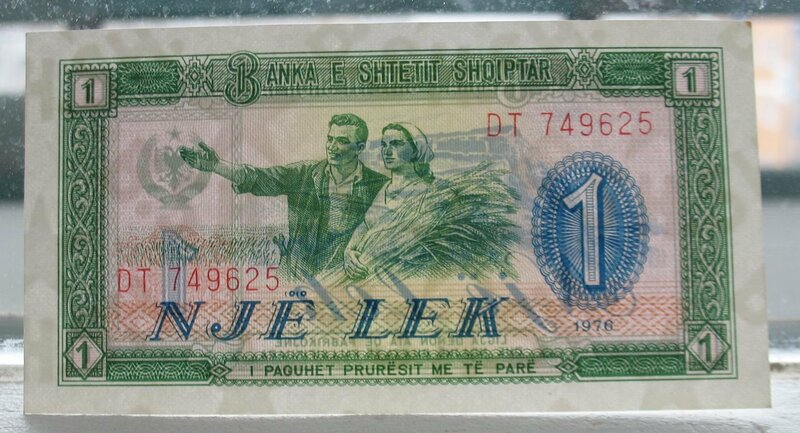 At the bottom is an inscription::"Banka e Shtetit Shqiptar. I Paguhet Prurёsit Me Tё Parё". Rozafa Castle (Albanian: Kalaja e Rozafës) is a castle near the city of Shkodër, in northwestern Albania. It rises imposingly on a rocky hill, 130 meters (430 ft.) above sea level, surrounded by the Buna and Drin rivers. Shkodër is the seat of Shkodër County, and is one of Albania's oldest and most historic towns, as well as an important cultural and economic center. 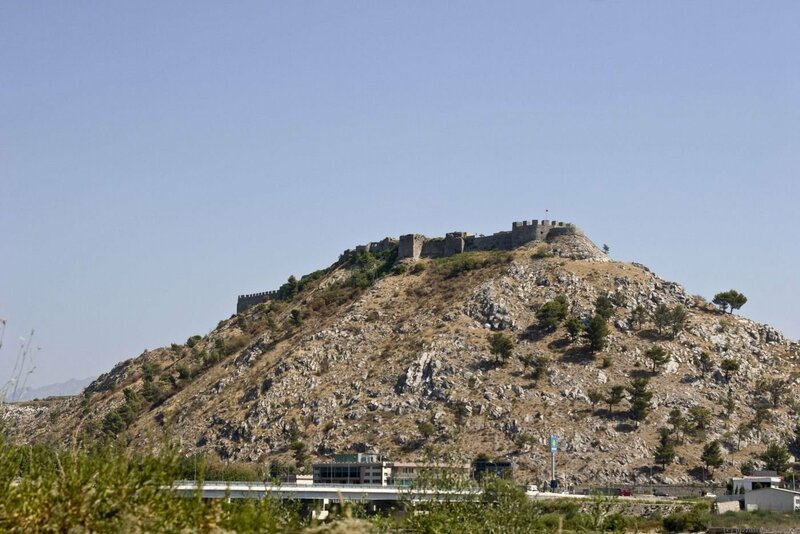 Due to its strategic location, the hill has been settled since antiquity. It was an Illyrian stronghold until it was captured by the Romans in 167 BC. The XIX-century German author and explorer Johann Georg von Hahn suggested that the ancient and medieval city of Shkodër was located immediately south of the Rozafa hill, between the hill and the confluence of Buna and Drin. The fortifications, as they have been preserved to date, are mostly of Venetian origin. 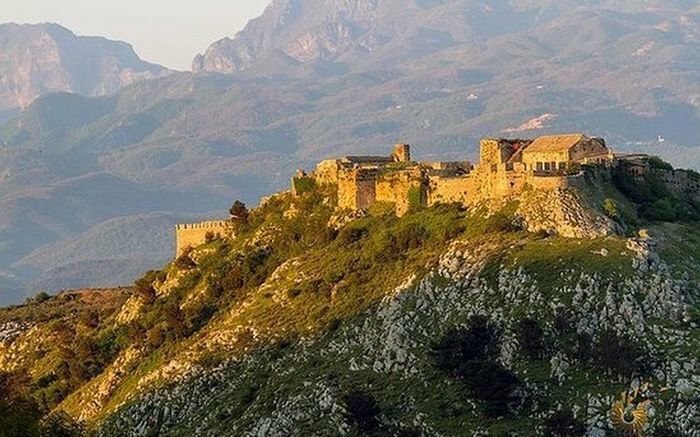 The castle has been the site of several famous sieges, including the siege of hkodër by the Ottomans in 1478 and the siege of Shkodër by the Montenegrins in 1912. The castle and its surroundings form an Archaeological Park of Albania. The old Shkodër tradition says: the three brothers could not build a local fortress at all - it was falling all the time. And then they decided to sacrifice to the heavens and strengthen the walls with blood. It was decided that the wife of her younger brother, the beautiful Rozaf, should be walled up. He could not tell her that for a long time. But one day he had to, and she courageously accepted it, saying: "Eclipse me so that I can feed my child." She was bricked alive at the base of the fortress, along with her son. 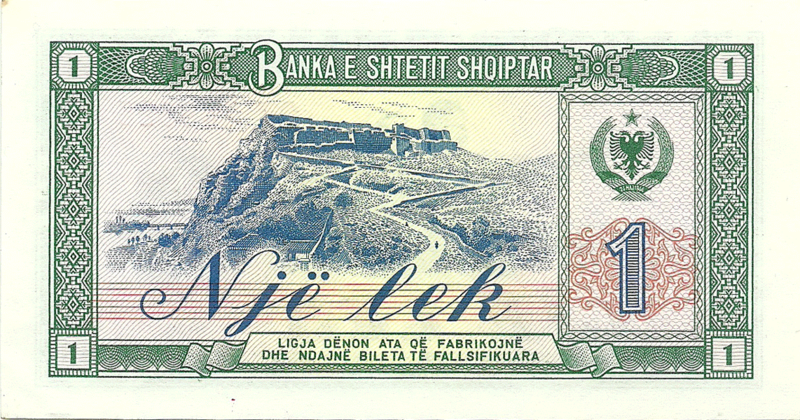 In honor of her fortress and named Shkodër. Similar legends tell tourists about many castles and fortresses of Europe. 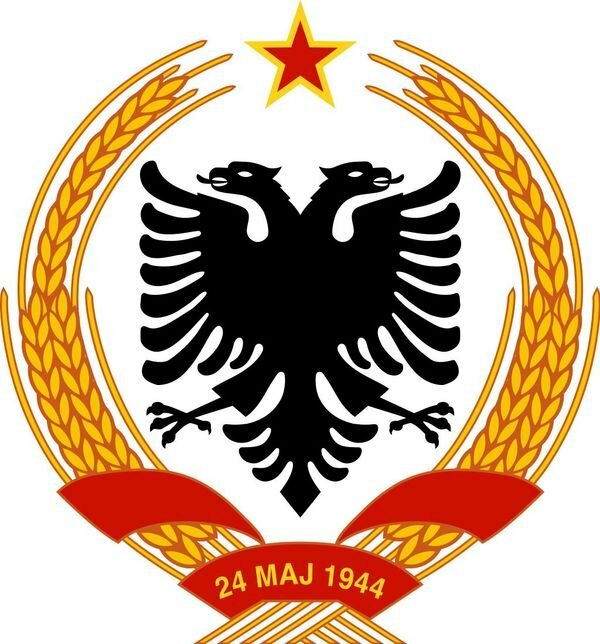 Top, right is the Coat of arms of the People’s Socialist Republic of Albania 1946-1992. 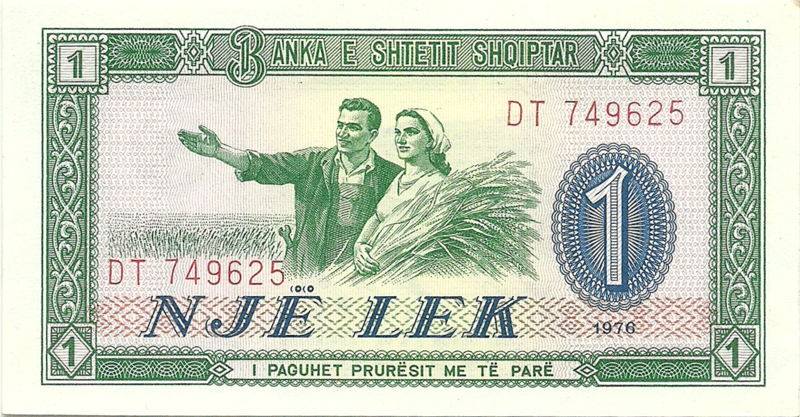 In 1965, notes (dated 1964) were introduced by the Banka e Shtetit Shqiptar in denominations of 1, 3, 5, 10, 25, 50 and 100 lekë. 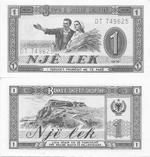 A second series of notes was issued in 1976 when the country changed its name to the People's Socialist Republic.